After Texas Hold’em, Omaha Hold Em’ is the most widely played poker variant in casinos. It could be argued that Omaha is a derivation of Texas Hold’em, but since it’s origins are unknown, this can’t stated with any certainty. It’s a community card game which means that players share the cards which are placed face-up in the centre of the table. The aim of Omaha is to create the strongest five card hand according to standard poker high rankings; it’s individual feature is that the hand must consist of two hole cards and three of the community cards. It’s played with blinds so the players to the left of the dealer will stake the small blind and big blind respectively. Now the showdown takes place in which the remaining hands are compared according to standard high poker rankings. 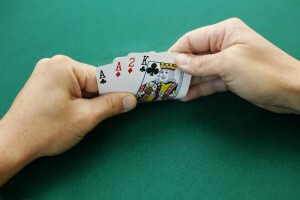 The hands must consist of two cards from the player’s hand and three from the community set. The above rules refer to the version of Omaha played to high rankings but Omaha Hi/Lo can also be played in which players try to make the best high hand and low hand (according to Lowball hand rankings).